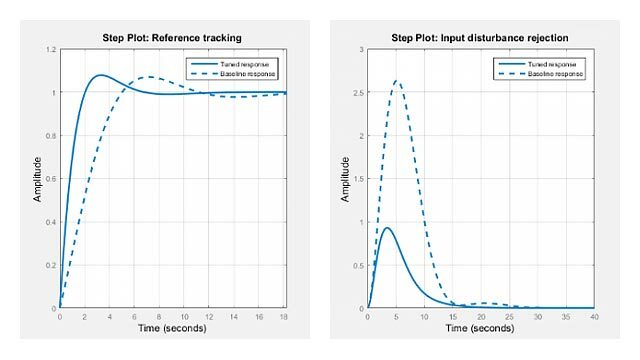 This example shows how to compute various measures of passivity for linear time-invariant systems. where yT(t) denotes the transpose of y(t). To measure "how passive" a system is, we use passivity indices. The system G is "input strictly passive" (ISP) when ν>0. ν is also called the "input feedforward passivity" (IFP) index and corresponds to the minimum feedforward action needed to make the system passive. The system G is "output strictly passive" (OSP) when ρ>0. ρ is also called the "output feedback passivity" (OFP) index and corresponds to the minimum feedback action needed to make the system passive. The system is "very strictly passive" (VSP) if τ>0. Let R=2, L=1 and C=0.1. Use isPassive to check whether G(s) is passive. Since PF = true, G(s) is passive. Use getPassiveIndex to compute the passivity indices of G(s). Since τ>0, the system G(s) is very strictly passive. Verify this for the circuit example. 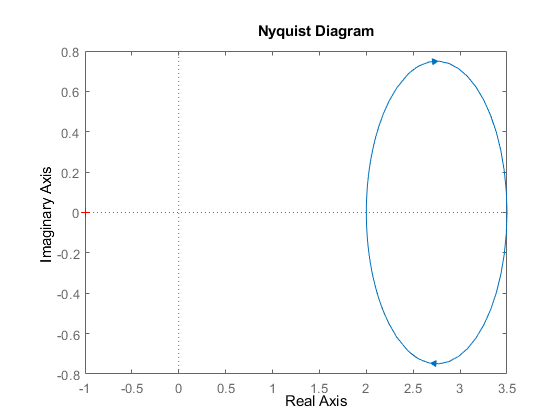 Plot the Nyquist plot of the circuit transfer function. The entire Nyquist plot lies in the right-half plane so G(s) is positive real. The leftmost point on the Nyquist curve is (x,y)=(2,0) so the input passivity index is ν=2, the same value we obtained earlier. Similarly, the leftmost point on the Nyquist curve for G-1(s) gives the output passivity index value ρ=0.286. The system G(s) is passive if and only if R<1, and the smaller R is, the more passive the system is. Use getPassiveIndex to compute the R-index for the circuit example. The resulting R value indicates that the circuit is a very passive system.